Imagine you’re shopping in your local Whole Foods when you discover dogs and cats in the meat case. You voice your protest, and the company responds by issuing a statement that it is sensitive to the companion animal issue, but that some customers requested dog and cat meat. Further, Whole Foods Market claims, it employs rigorous animal welfare standards, and the animals live in an enriched environment before they’re humanely slaughtered. 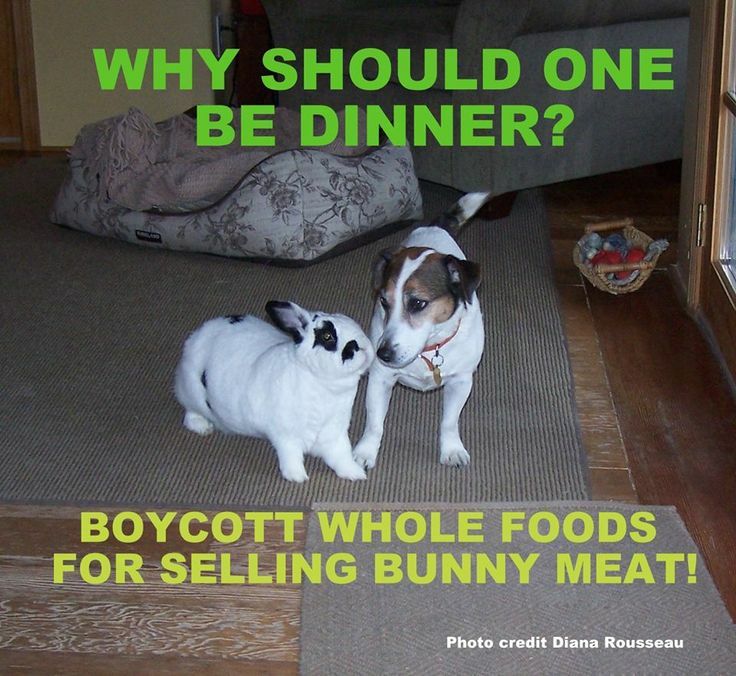 Now, as you look at your beloved dog or cat lying beside you, imagine how those of us who live with bunnies feel about Whole Foods selling our playful, loving and curious animals for dinner. Rabbits are the nation’s third most popular companion mammal. We began to voice our protest, along with many others, including dog-and-cat-people, vegetarians and meat eaters. Some of us who shopped primarily at Whole Foods now go out of our way to boycott it. Many customers were already insulted by the company’s greenwashed claims that all of the animals it sells are humanely slaughtered. 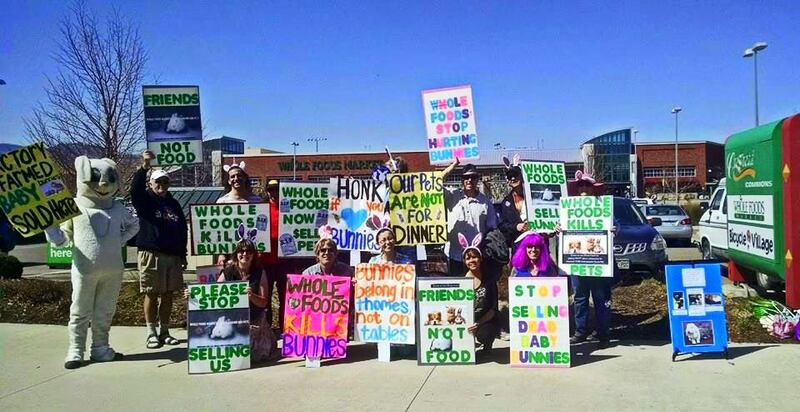 And so, with the rabbit being the symbol for Easter, we protested Whole Foods in Boulder this past weekend. We protested not because domestic rabbits deserve to live more than any of the other animals killed for Whole Foods, but because rabbit meat is a fairly small market in the United States, and Whole Foods is the most profitable natural foods chain, wielding great influence on other stores that seek to emulate the company’s success. Whole Foods does not need to add to the long line of animals it already sells, nor should it add family pets to its offerings. Further, domestic rabbits already have enough problems. They are routinely slaughtered for their fur and flesh and used in experiments. Like chickens, rabbits are not covered by the USDA’s Humane Methods of Slaughter Act. As pets, they’re misunderstood, neglected, dumped at shelters or “set free” to die. Those of us who live with rabbits are often at the receiving end of “jokes” about violence against our loved ones. 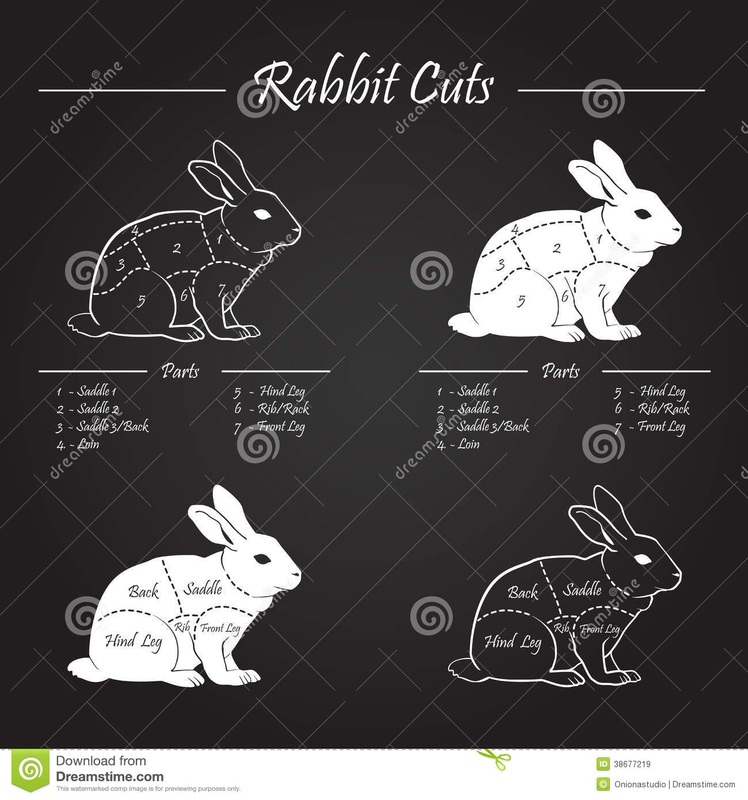 The last thing rabbits need is for Whole Foods to popularize the consumption of their flesh among the mainstream. The company states it does “not allow any animal testing for any of our personal care products, ever”—great news for rabbits—but it now encourages customers to, “Come hop down the bunny trail and get yourself some delicious rabbit today!” Is this how Whole Foods shows it’s being “sensitive to the companion animal issue”—by using words from a children’s song to sell violence toward our companions? Whole Foods announced its pilot campaign to begin selling rabbit meat at a handful of locations around the country last summer. Since then, it has expanded from two initial regions to most of North America, although it has not introduced it in Boulder yet. There may be a marginal demand for rabbit meat in some areas, but a far greater demand exists for rabbits as companion animals. In fact, Whole Foods is creating an artificial demand for rabbit flesh by auto-shipping it to its stores across the country, whether they want it or not. The company buys its rabbit “fryers” and “stewers” from suppliers in states that have passed ag-gag laws that restrict outside inspection and verification of standards. Under company guidelines, an eight-pound adult rabbit can be housed his whole life in a two-foot by two-foot space. A mother and her eight babies can be housed in a two 1/8-foot square space.These white New Zealand rabbits can live 8–12 years as sociable, litterbox-using companions in the house and are known as the Golden Retrievers of the rabbit world. Whole Foods is already under nationwide attack for the animal cruelty that lies beneath its veneer of feel-good marketing about humane standards. However, the fact is that even if the company were to meet the standards of rabbit protection groups for raising this species, at the end of the day, a barely weaned baby rabbit is taken from her family and slaughtered, just so Whole Foods can make a buck. Tell Whole Foods how you feel about its new product. The Fight Against Whole Foods Isn’t Just for Rabbits Will Rabbits Be The Next Chicken? 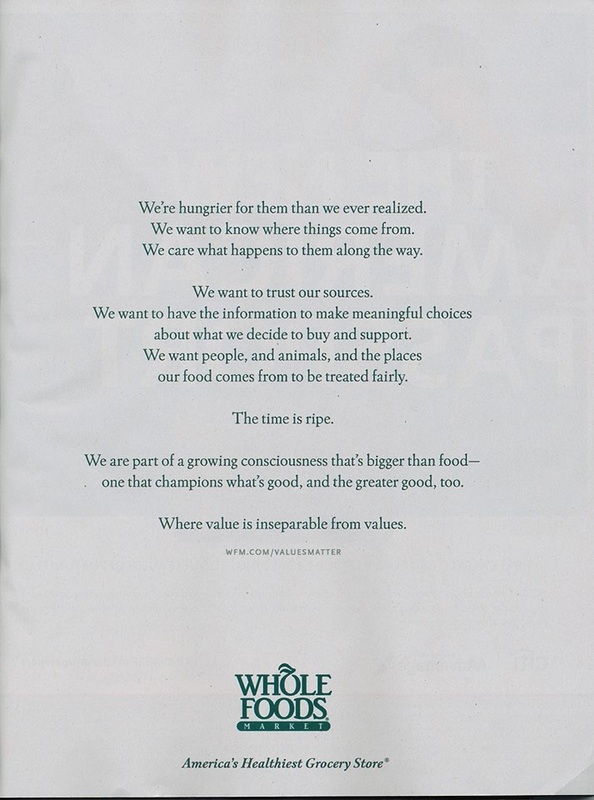 Whole Foods Says “Values Matter” What Does Whole Foods Value?